The Georgians had a passion for the picturesque, manufacturing it where necessary, and blending it into the landscape to appear natural. These two features, the icehouse and the folly arch seem to have been built at the same time, probably in the late Georgian to early Victorian era. In 1816 the nave of nearby Leyland Parish Church (St Andrews) was replaced, and some of the carvings probably come from there. When the new part of Worden Hall was built in the 1840s (see here), these structures could well have been added to the parkland. 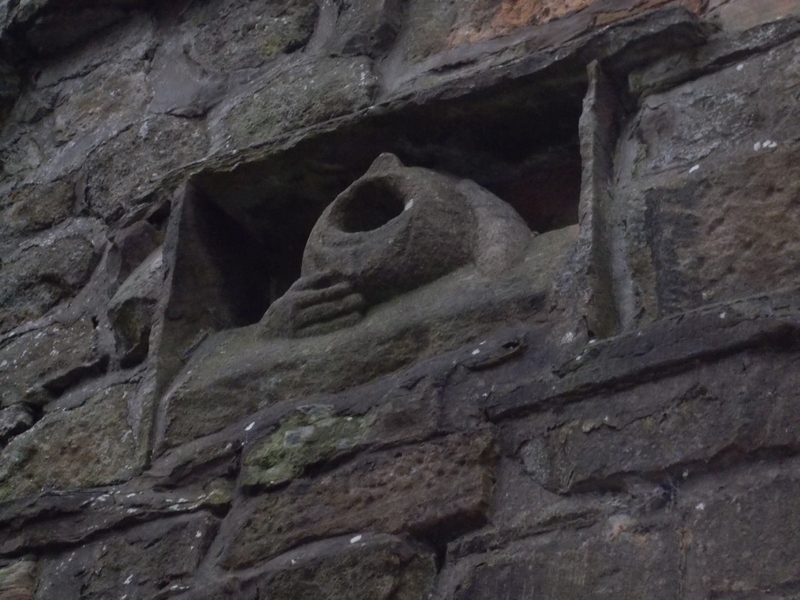 The icehouse has an unusually shaped door, called an ogee. Either side of the door are two carved figures, probably from the church and dated to around the 1500s. They sit on two corbels that were clearly not designed to hold them. Other carvings include three shield shapes and a block with a hollow spandrel. There’s no access to the inside of the ice house, but if you take a few steps up the path to your right, you can see it has a large mound behind it. As you stand on the mound you’ll notice a large inscribed rock. The inscription states “Greenstone porphyry, Helvellyn, Prof I Phillips, brought from Worden drift”. This is a “glacial erratic”, a stone brought from Helvellyn in the Lake District by a glacier during the last ice age. 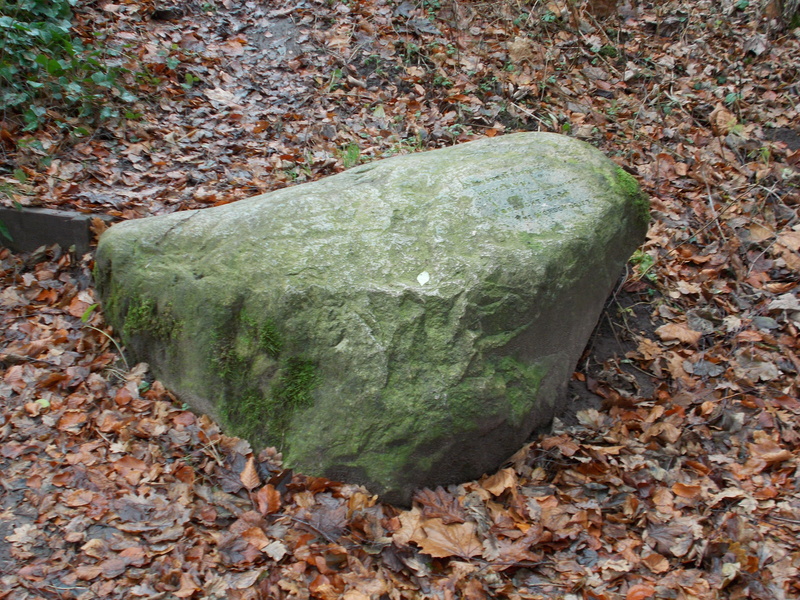 A much larger erratic exists at Crossens near Southport, see our page on it here. If we follow the path down to the woods and the brook we reach our second picturesque feature, a folly arch spanning Shaw Brook, with a small waterfall/weir beneath it. A second broken arch seems attached to the first, but this one was never whole and the ruinous condition would be thought to add to the romance of the setting. On the south bank the complete arch is connected to a turret. High up on one side of this is a strange carving, possibly a gargoyle holding its own face. You can continue your walk by the brook, through what was called “Ruin Wood” on old Ordnance Survey maps. The rhododendrons mixed in with the native trees give this a classic feel of being in the woodlands of a large country house. Parking: Free parking at Worden Park. Then head for the formal gardens and follow the signposts.